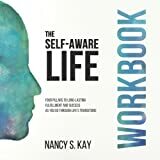 Nancy Kay is the International Best-Selling author of The Self-Aware Life: Four Pillars to Long-Lasting Fulfillment and Success as You go Through Life’s Transition. She is also a licensed professional counselor and a certified executive coach who is passionate about helping people get unstuck and live the life they desire. Nancy Kay is the International Best-Selling author of The Self-Aware Life: Four Pillars to Long-Lasting Fulfillment and Success as You Go Through Life’s Transition. She is also a contributing author for The Handbook of Personal and Organizational Transformation Textbook. Nancy is a licensed professional counselor, certified executive coach, and owner of Grace Counseling Service LLC and SelfAware 101 Coaching. She is certified in Emotional Intelligence and is a Dare to Lead™ Facilitator. She integrates her experience of being a registered nurse at The Children’s Hospital in Denver with her 24 years of being a clinical counselor and coach to focus on all aspects of wellness and productive living. Nancy has lectured nationally and internationally on topics such as emotional regulation, leadership, communication, personal development, and self-awareness. Her current and past clients include individuals from Walmart, Tyson, Arvest Bank, Harps, JB Hunt, Simmons Bank, and numerous successful small business owners. Nancy has a Bachelor of Science degree in Nursing from Wichita State University and a Master of Arts in Counseling from Denver Seminary. She received her executive coaching certification from The College of Executive Coaching and is a member of the International Coach Federation. The motto for her business and her life is: Be Aware and Live Intentionally.